Sia’s come a long way since “Breathe Me,” a song so emotionally vulnerable, it’s overwhelming. No wonder premier pop starlets have been knocking on her door, hoping for a piece of her songwriting genius (just ask Rihanna and Beyonce). 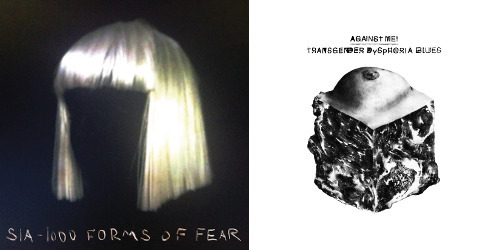 Luckily, though, Sia held onto some of her gems for her first release in four years. The moving-on mantra “Burn the Pages” is a glorious circus of sounds, while soaring ballads “Big Girls Cry” and “Eye of the Needle” take her to new heights. A stunning full-blown pop achievement, this album should do the same. Against Me!’s sixth release is a deeply personal outpouring as necessary – both to now-frontwoman Laura Jane Grace and the band’s fans – as it is empowering. An open diary exploring internal and external struggles with identity – but also, acceptance and love, fear and loss – the complex, often-tremendous “Transgender Dysphoria Blues” triumphs at acknowledging one’s differences and the power that can be had when we embrace them. It’s hard not to wish eternal sadness upon Lykke Li – her gloom inspires greatness. Thankfully, then, the Swedish songstress is in a bleak place on “I Never Learn,” an emotional reflection of fragility and isolation that abandons almost all sense of hope – and also almost all sense of pop. Li is better for it: The intimacy she strikes on “I Never Learn” is a portal into her broken heart. The title is insane. The retouched album art, even more so. So how is it that Mariah Carey’s 14th album defies expectations, making for one of the diva’s best? Simply put: She. She is Mariah. And from the surprisingly low-key lead-in, “Cry.,” to the glass-shattering gospel stunner “Heavenly (No Ways Tired / Can’t Give Up Now),” Carey affirms that when you’ve survived “Glitter,” anything is possible. Affecting without any of that sentimental preciousness, there’s a transparency to Sharon Van Etten’s latest that daringly exposes the visceral emotions of the end of a relationship. A stunningly sad truth-telling about two hearts that have grown apart, “I Love You But I’m Lost” cuts deep. “I Know,” too, is simple poignancy told potently. This fourth album from Van Etten is a work of soul-baring genius. An enveloping soundscape of crescendos and thoughtful literary reflections, the Brooklyn band’s fifth album is, at its core, concerned with catharsis – particularly having to do with mortality. That universal certainty is threaded throughout “Familiars.” Void of singles, its intention is to be heard as a full narrative. Conjuring one endless dream with its majestic lacing of twinkling pianos and wistful horns – on “Palace,” particularly, it sounds like the sky is opening up – The Antlers know that even in death, there’s life. Tori Amos is reinvigorated on “Unrepentant Geraldines,” a compelling return to the back-to-basics sound of her ’90s zenith. “Invisible Boy,” an obvious standout, wouldn’t have sounded out of place on any of Tori’s earliest works. Then there’s “Promise,” an inspiring conversation with Amos’ daughter that sweetly embodies the lifelong bond between mother and child. Lana Del Rey’s follow up to her claim-to-fame, “Born to Die,” is such a convincing piece of mainstream-defying art that it’s easy to write off that “Saturday Night Live” flub. Fleshing out the persona introduced on its 2012 predecessor, Rey’s follow-up feels like a hallucinatory acid trip – it could levitate you to the sky on its feathery sound pillows.